These tins are a great way to send something special to that someone special. Choose from our three options or send that special someone one of each! Our Chocolate Lovers Tin includes a 25 oz. mix of our delicious chocolate covered peanuts, chocolate covered cashews, and chocolate covered peanut brittle. Our Chocolate Brittle Tin includes 36 oz. of our sinfully good chocolate covered peanut brittle. Our Chocolate and Butterscotch Tin includes 25 oz. mix of our chocolate covered peanuts, chocolate covered brittle, and our award winning butterscotch covered peanuts. PLEASE NOTE: THE VALENTINE'S DAY LABEL MAY CHANGE IN DESIGN STYLE AND/OR COLOR FROM YEAR TO YEAR. Best peanuts we've ever had! So great to know they're produced right here in NC! Excellent, I would recommend this product to everyone. 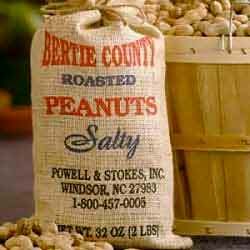 My wife loved the gift - chocolate covered peanuts, cashews, and peanut brittle. We just opened our chocolate peanuts, etc. today -- very good way to finish our Valentine meal! 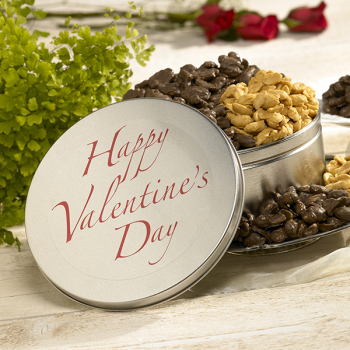 My husband loved the Valentine tin & we have already tasted some of the delicious nuts & brittle. 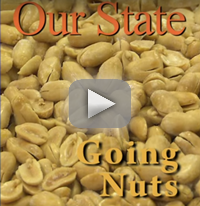 A winning combination; quality cashews, peanuts and peanut brittle covered in delicious dark chocolate. Everybody loved it. They are irresistible...can't stop eating them! A winning combination; great chocolate covering the best blister fried peanuts, cashews and peanut brittle. The brittle almost melts in your mouth. Should be available all year, not just at Valentine's Day.